ture,Timer and Clock of the current indoor/outdoor simultaneously. 1>Open the battery cover, below the stand. *Low battery Warning: This warning icon will appear on the LCD screen when the main unit battery is low and need replacing. * When the power is off, Time/Temp,Hum/Max,Min will be resetted. 2. Temperature Setting : This unit will measure the Indoor/Outdoor Temp. *°C/°F Exchange : The temp will be displayed in °C or °F unit. The unit can be selected by switching the °C/°F slide switch at the back of the unit. *In/Out display shows indoor Temp(with In icon) or outdoor Temp(with Out icon) selected by the In/Out key. *Maximum/Minimum : The user can view the maximum and minimum Temp./Humidity records by pressing‘Max/Min’key. Press the key once again,it will return to the normal situation. 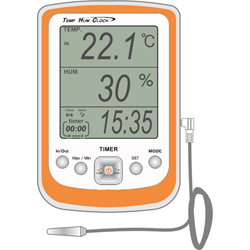 The Max/Min recorded Temperature and Humidity readings will automatically be stored in the memory. 2>PressSETuntil the Hour is set. 4>PressSETuntil the Minutes is set. 5>When the last setting has been made, Repeat pressMODEto exit and return to the normal time display mode. 1>PressMODEand a ‘Alarm’ signal will be displayed on the LCD. disappeared  ‘Alarm’ signal or will automatically return to the normal time display mode. 2>Holding down  key for 3 Sec., setting will be changed to 00:00. 3>In state of inputted Min/Sec at timer, press  key for count start and press the key once again for stopping. 4>After count is completed, you hear the Alarm, then press   key to stop. - Flip-out the plastic stand on the rear of the unit for table standing. Stand the unit on a flat surface.